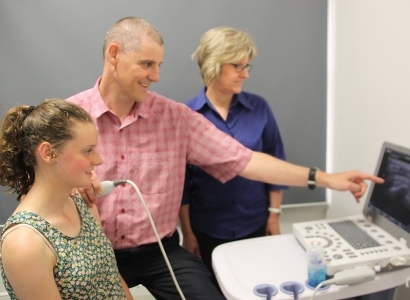 AAP Education hosted ultrasound workshops are conducted by Peter Esselbach who has over 25 years experience in private practice medical sonography, both as a practitioner and as an educator. Peter is a musculoskeletal physiotherapist with over 10 years experience in private practice, specialising in musculoskeletal and sports physiotherapy. Peter is also a qualified exercise physiologist and has extensive experience in ultrasound guided interventional therapy. This includes corticosteriod injections, autologous blood injections, platelet rich plasma injections and Synvisc injections. Peter utilises real time ultrasound imagery within his physiotherapy practice to assist in the diagnosis of musculoskeletal injuries and in the rehabilitation for core stability imbalances. AAP Education hosts weekend workshops in Western Australia, designed for a wide range of health professionals (including physiotherapists, doctors, chiropractors, osteopaths and podiatrists) with an interest in using musculoskeletal ultrasound within clinical practice. More information on upcoming Rehabilitative Ultrasound Workshop dates can be found here.